The Sigtec flotation unit is designed to treat wastewater with medium to high solids loading. The capacity of the Sigtec units ranges from 500 to 1000 m3/hr. The Sigtec series are designed to create the optimal circumstances for easy separation of the solids. The large free surface area and long retention time guarantee an optimal separation performance. 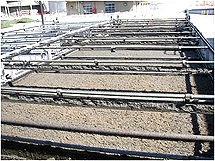 The solids are collected in the sludge thickener and transported to the sludge cone with a low friction scraper system. The sludge can be discharged with the sludge pump for thickening or discharge. The concrete tank is built on site. Kemeo supplies internals only. The rectangular concrete flotation tank is be suitable for medium to highly polluted wastewater, COD up to 10.000mg/l. Suitable for high flows up to 1000 m3/hr for a single unit. Low maintenance through low friction skimmer system. Efficient saturated water supply system. Parts manufactured out of stainless steel. Parts are suitable for transport in a standard sea container.